Here's a few ideas Jerry cooked up. Rinse the soaked cashews, and discard soaking liquids. In a blender pulse together, on low the cashews and water. Add in the basil, kale, garlic, salt and pepper and blend on low until totally smooth. Transfer soup to an airtight container and refrigerator for at least one hour or until chilled all the way through. Roast the corn, in their husks, in a 400°F oven for 15 minutes. Remove and allow to cool. Husk the corn and cut the kernels from the cob. Finely dice the onion and red pepper. Mix all of the ingredients together in a small bowl and season with salt and pepper. Make the soup: Place the cantaloupe, lemon juice, and zest in a food processor fitted with a metal blade and pulse until roughly chopped. Add the mint leaves and salt and pulse to combine. Transfer to a large bowl, cover, and chill for at least 30 minutes. Make the basil cream: Place the cream and sugar in the bowl of a stand mixer set with the whisk and beat until lightly thickened. Add the basil and continue to beat until thick. Add the Prosecco to the soup right before serving. Divide evenly among four bowls and top with the cream. Make the soup: Heat oil over medium-high heat, add the onions, carrots, and garlic, and cook for 5 minutes. Add the sugar, curry, and cayenne and cook for 1 more minute. Cover the carrots with water and bring to a boil. Reduce to a simmer, cover, and cook until carrots are tender, about 15 minutes. 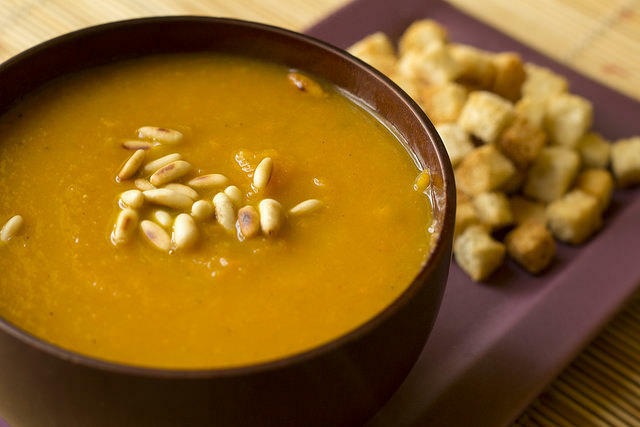 Puree soup in batches in a blender or food processor until smooth. Stir in the lemon juice and zest and season with salt. Chill in the refrigerator for 1 hour or until cold. Make the relish: Combine the cucumber, pistachios, ginger, cilantro, and mint in a small bowl. Season with salt. Ladle the soup into bowls, add a dollop of yogurt and top with relish. Combine the sugar, water, ginger, star anise, zest and grapes over high heat in a medium saucepan. Bring to a boil and cook until sugar is completely dissolved and the grapes soften, about 15 minutes. Mash the grapes with a potato masher until they release most of their liquid and strain into a large bowl. Stir in the lemon juice and chill the broth in the refrigerator for at least 1 hour. In a saucepan combine the wine, the sugar, and 1 cup water and bring the mixture to a boil, stirring until the sugar is dissolved. Simmer the syrup for 5 minutes and let it cool. In a blender or food processor purée the grapes with the syrup and strain the purée through a fine sieve into a bowl, pressing hard on the solids. Stir in 1 cup cold water and the lemon juice and chill the mixture, covered, until it is cold. Pour the mixture into a shallow glass baking dish and place in the freezer on a level surface. Stir the granite with a fork every 30 minutes, crushing the large frozen clumps, for 2 to 3 hours, or until it is firm but not frozen solid. Scrape the granita with a fork to lighten the texture and serve it with the soup.